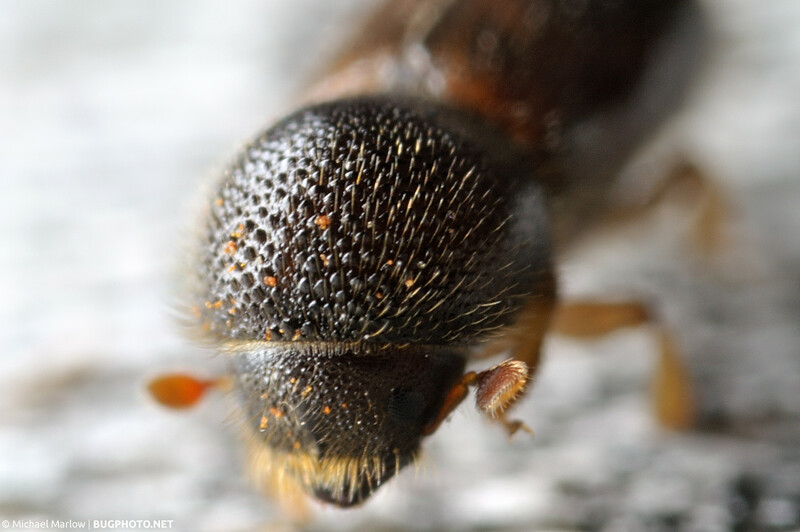 This is the sixth in a series of posts about the BugPhoto approach to macro photography. A globular springtail, Bourletiella hortensis, about the size of a poppy seed, perches on a dandelion petal. Shot with reversed 18-55mm Nikon kit lens (at 18mm) on extension tubes (~60mm). Uncropped. If you have been following along with The BugPhoto Guide series, or just BugPhoto.net in general, you are probably aware that I have a bit of an obsession (if they can come in bits) for getting closer, for getting higher magnification. I showed the range of magnification of my reverse lens in my last post, which tops out at a little less than 4:1 (i.e. 4 times) magnification. Sometimes this obsession to get closer works against me: I go in too close, cutting off my subject, or I sacrifice my composition at the expense of magnification. So, you may be wondering why would I want to push the envelope further? That is, for reasons aside from compulsive behavior? Well, sometimes there are things so small that four times and even greater magnification won’t fill up the frame. Springtails (Collembola) such as the one pictured above, are some of the tiny creatures that beckon the ever-increasing magnification of extreme macro. Extension tubes quite literally are tubes; they have no glass. To say the least, it’s a pretty cumbersome beast. (Of course, if you want to get nuts, take a look at Eddie the Bugman’s monster of a rig — that’s taking a cannon (and a Canon MPE-65, as it happens) to a bug shoot!) 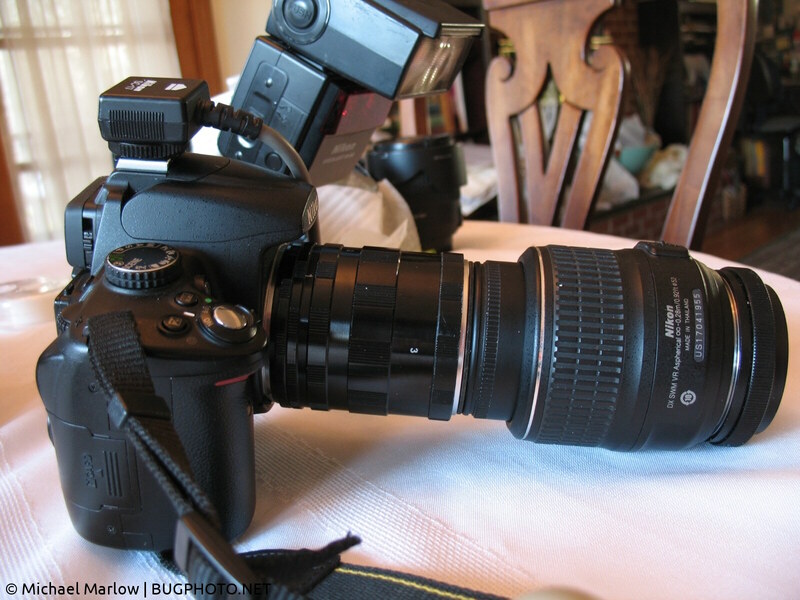 Please note: I would implore you to take even more care with handling equipment in this type of set up, as stresses on lens and mount connections become greater. Dead moth with plastic ruler in background (divisions shown are in millimeters) shot at 18mm with extension tubes (~60mm). Dead moth with plastic ruler in background (divisions shown are in millimeters) shot at 24mm with extension tubes (~60mm). Dead moth with plastic ruler in background (divisions shown are in millimeters) shot at 55mm with extension tubes (~60mm). Challenges? You need more than one? The challenges of handheld extreme macro are not unlike the challenges of more “normal” handheld macrophotography. First off, the unit becomes that much more unwieldy and heavier. Shooting one-handed becomes prohibitive (though I will defer to individual arm strength). Keeping the camera steady becomes more paramount, if not necessarily to ward off camera shake and image bluriness, but to keep your subject “in focus.” I put it in quotes because the depth of field is almost comically narrow at the higher magnifications. Tiny things like springtails which can be less than a millimeter in size fit right into the focal plane, but the slightest movement also pushes them right out. Having something sturdy to brace against — like the ground, which fortunately is often where springtails are — really makes this type of endeavor more feasible. 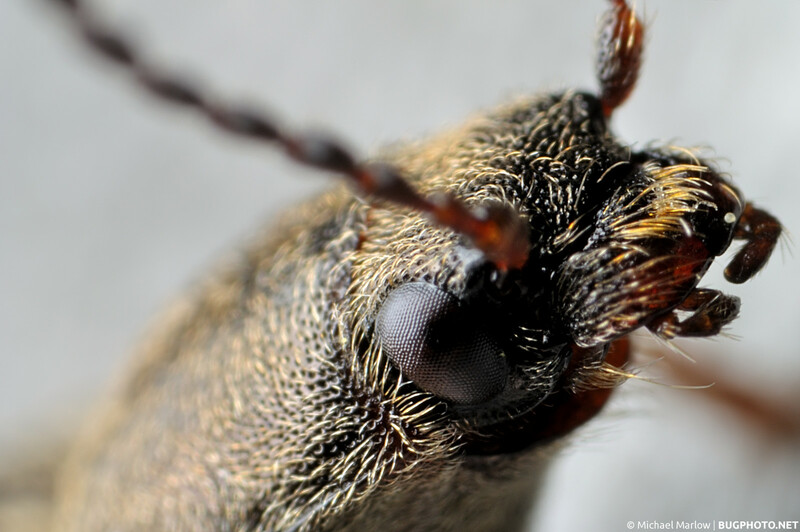 Portrait of a click beetle (family Elateridae). Shot with reversed 18-55mm Nikon kit lens (at 18mm) on extension tubes (~60mm). Uncropped. The issue of illumination becomes exacerbated with the extended passage light must travel through to get to the camera’s sensor. Not only is it very hard to see through the viewfinder — it’s dark in there! — at this focal length/extension, diffraction becomes a serious problem with the very small apertures needed to get a workable depth of field. Some people use “live view” and set up the shot via the LCD screen. I personally have a hard time using this method, as I just can’t brace the camera well enough. One tactic that I employed to get some of the extreme shots from this summer was to use a flashlight to give extra illumination. It was a little difficult to hold the flashlight and the camera at the same time; I tried tying it to the camera/lens at one point, which sort of helped (admittedly I could have put a better effort/devised a better way of securing the flashlight). Extreme close up of a beetle head. Shot with reversed 18-55mm Nikon kit lens (at 18mm) on extension tubes (~60mm). Uncropped. 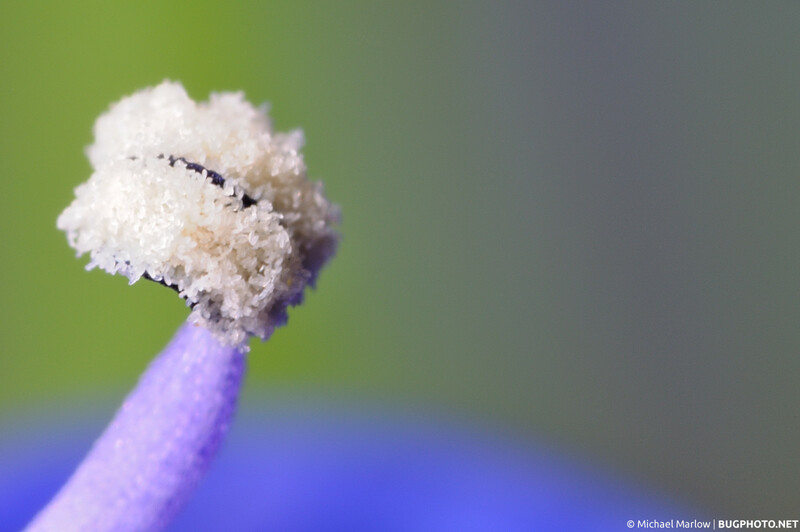 Extreme close-up of a flower’s pollen-filled anther. Shot with reversed 18-55mm Nikon kit lens (at 18mm) on extension tubes (~60mm). Uncropped. I only started to dabble in this extreme macrophotography this past summer, and it was very frustrating and eye-straining at times. Maybe I would have been better served taking some breaks in between failed shots. Though, it did all seem worth it, when I got the springtail shot. Thinking on it now, the real payoff (not to get too corny) might have been gaining a greater appreciation for the ever-hidden, infinitesimal natural world that we hardly think of. And let’s face it, it’s tough to think of things we can barely see with the naked eye. But it’s worth looking, I’d argue more than a little, with or without a ridiculous camera rig. In the next BugPhoto Guide post, I’ll look at shooting video with a reverse lens. Two DIY baffles – like the black circle of cardstock shown at the bottom — are placed inside the tubes at either end to eliminate reflections from the unevenly painted interior, which result in ghosting in the image results. DIY baffles – like the black circle of cardstock shown at the bottom — are placed inside the tubes at either end to eliminate reflections from the unevenly painted interior, which result in ghosting in the image results. 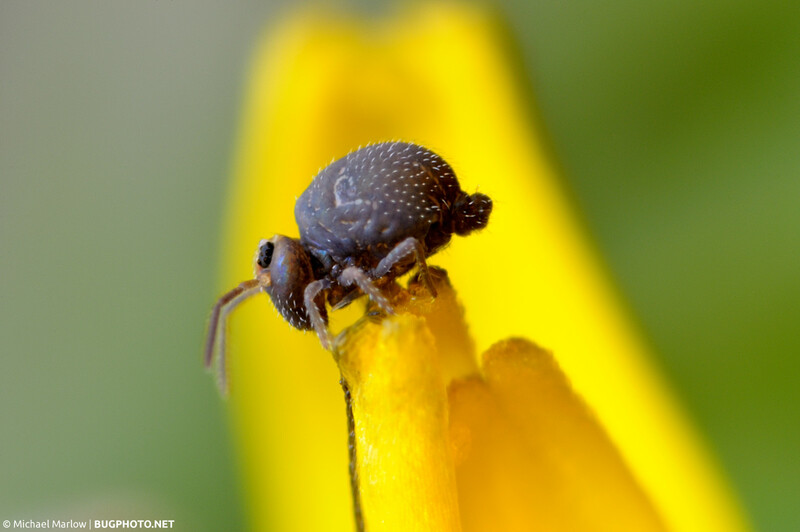 Posted in Coleoptera, Collembola, Flowers, Jumping Spiders, Photo GearTagged anther, Bourletiella hortensis, BugPhoto Guide, click beetle, extension tubes, extreme macro, macrophotography, pollen, Salticidae, springtailBookmark the permalink. The macro Helicon FB Tube would be a useful tool. It’s a focus braketing extension tube that automates focus stacking. For those who are unfamiliar with focus stacking, it’s the technique of taking multiple shots of a subject and blending them in post-processing. Basically, you are blending different focus points resulting in an image that is clear and detailed from point to point. So often you’ll see a picture of a flower, for example, and it’s blurred or fuzzy — especially at the outer edges of the petals. It’s just not a good picture. With focus stacking you take 2 or more pictures of the center and edges of the flower so that you have a stack of selectively focused images. They are then blended with software to produce and amazingly crisp photo. This can be difficult if you’re trying to focus stack a moving object because you have to manually shift your focus to capture the next image. The FB Tube automatically shifts your focus and captures the images in continuous shutter mode. Focus stacking is really essential in creating amazing macro photography. Matching the right extension tube with the right lens can produce eye-popping results as seen in this image by Reed Andariese. Notice that the wings of the butterfly are detailed and in-focus from wingtip to wingtip.